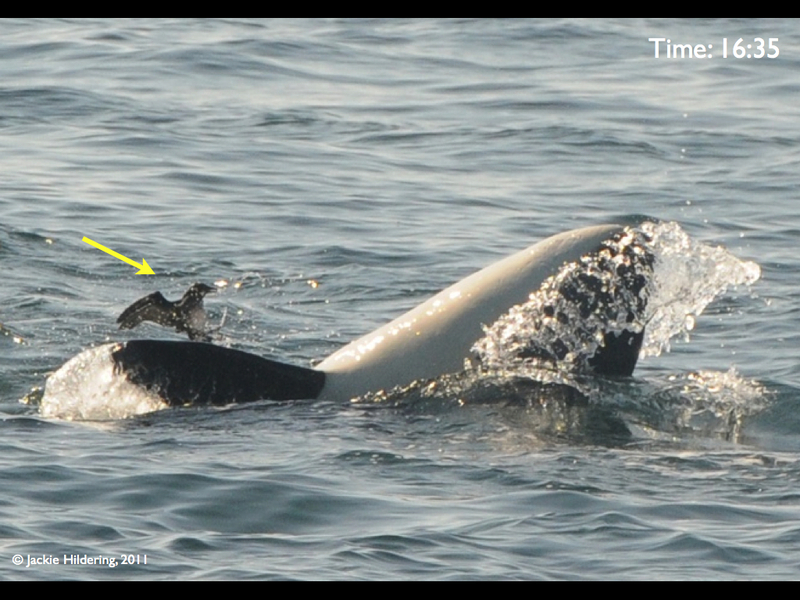 Transient killer whale grabs rhinoceros auklet. See slide show below. Photo: Hildering. All photos taken with telephoto and cropped. From the evidence I deliver in the slideshow below, you’ll see that August 31st, 2011 was not a good day for some rhinoceros auklets (Cerorhinca monocerata) in Johnstone Strait, British Columbia, Canada. That day, I witnessed a very socially active group of “transient” (marine mammal-hunting) killer whales repeatedly harassing these birds – mouthing them and slapping them. At least 3 juvenile rhinoceros auklets had a bad day and, since these are diving birds, they cannot “alight” and escape the teeth and fins below them. Yet, I believe they survived. Transient killer whale surfaces right beside rhinoceros auklet. See slideshow below. Photo: Hildering. All photos taken with telephoto lens and cropped. 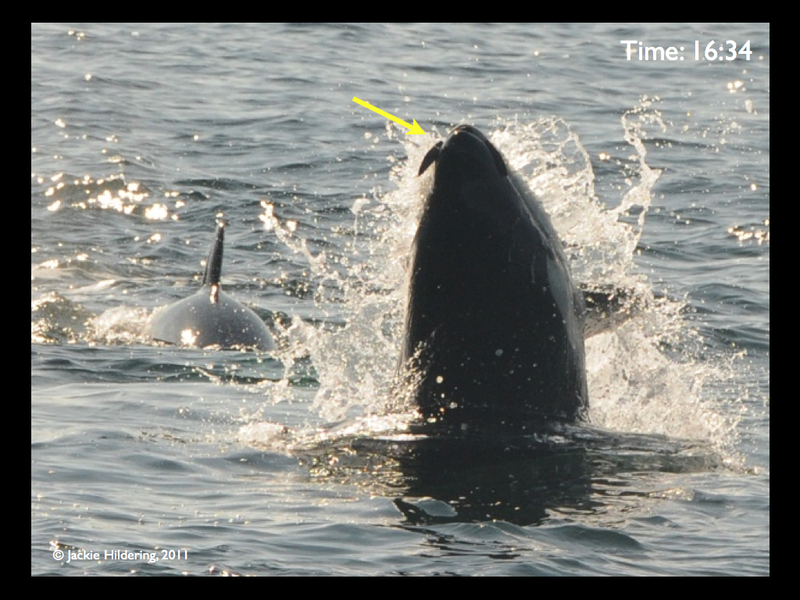 Transient killer whale tail-slapping a rhinoceros auklet. See slideshow below. Photo: Hildering. All photos taken with telephoto lens and cropped. 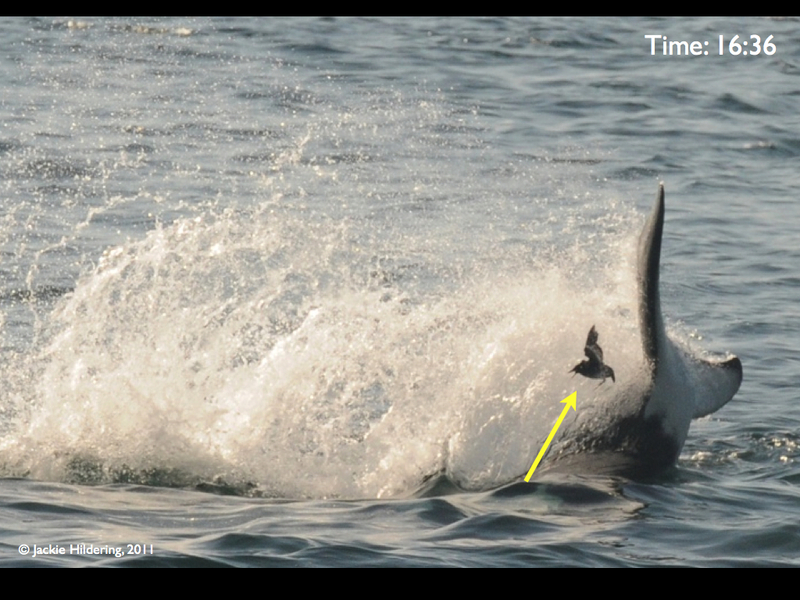 I personally had never seen such a prolonged display of this transient killer whale play behaviour before. In fact, I had never seen transient killer whales socialize quite so rambunctiously! In the Northeast Pacific, “transient” killer whales (or “Bigg’s killer whales” – after the late Dr. Michael Bigg) are believed to have diverged from the “resident” (inshore fish-eating) and “offshore” (offshore fish-eating) killer whales some 700,000 years ago (Morin et al, 2010), to refine a culture of stealth and unpredictability in order to hunt their marine mammal prey. Jared Towers of the Department of Fisheries and Ocean has confirmed the IDs of the transient killer whales in the August 31, 2011 encounter to be: T010s, T034s, T035s, T037s, T046Bs, and T146s. Photos taken while on board with Orcella Expeditions. Too me this photo sequence is totally amazing. I have long read about these same pelagic birds being the target on occassion of killer whales. However this is the first time that I have ever seen such an encounter. Great work Jackie!